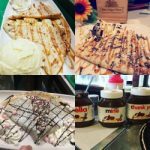 An independent cafe serving everything from chocolate Kebabs, Waffles and Milkshakes to Freshly prepared Sandwiches, Salads and of course, crepes! They are based just across from Wilkos and the bus station entrance. 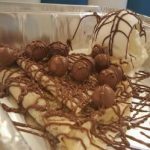 Check out their Nutella and Malteser Crepe!! This creperie boasts 60 crepes sweet and savoury. You can eat in or even order a deliveroo! 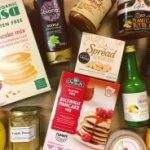 Join these guys on Tuesday between 11.30am-2.30pm for a flipping delicious day- they’ll be creating vegan pancakes with both sweet & savoury fillings Pancakes will be FREE but a donation to Human Kindness Vegan Food Bank would be appreciated. Join the Facebook event here. 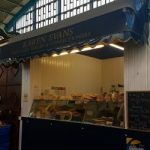 If you want freshly made pancakes to go, then visit the ladies on the Karen Evans stalls in the market. Last Shrove Tuesday they sold thousands so get there early – the wait will be worth it! 4 for £1.65 or 44p each, flour or plain! You can also get a few cheeky welsh cakes there while you’re at it too!!!! Everyone’s talking about it as our Parc Tawe restaurant is the first in the UK, branded as The Home of the Breakfast! 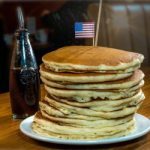 Have your pancakes the American way made fresh to order, using the same special pancake recipe as the restaurants in the US. If you prefer your pancakes fluffy and not flat, Denny’s is the place for you! 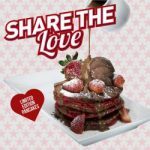 A dessert house in the heart of the city that offers the world’s favourite hot and cold desserts under one roof including a great selection of Crepes. Will you go for Traditional Crepe (sweet an simple) or a White Choco berry Crepe (Freshly baked crepe, served with melted white Belgian choc flakes and drizzled with mouth-watering raspberry and white choc sauce) – or possibly this limited edition version!!! The information provided in this blog is gathered from third-party sites and was correct at the time of posting. We (Swansea BID and Big Heart of Swansea) cannot be held responsible for any misinformation and/or cancelling of events. We advise that you contact any third parties for clarification of information (including terms & conditions, opening times, dietary requirements, general business information etc.) to avoid any confusion. The above information does not form an affiliation with these businesses nor does it form a recommendation of services and/or products.